This extravagant collection of deluxe Spa body care products refreshes the body and mind with an aromatic blend of natural magnolia. The fragrant blossom fuses with essential oils to work soothing magic throughout the body. This gift includes refreshing lotion, exfoliating shower gel, bath gel and more. Make her feel like a queen right at home. This gift includes: -Faux leather tote -Moisturizing body lotion -Invigorating body spray -Moisturizing bath and body gel -Soothing body butter -Body scrub -Bath loofah ball -Sisal back loofah -Assorted toffee chocolates -Herbal tea -Foot massager -Back massager -(3) Mini aromatherapy candles -Mini wooden cosmetic mirror -Aromatherapy potpourri -Body butter soap bar. This is truly a luxurious gift she will love! 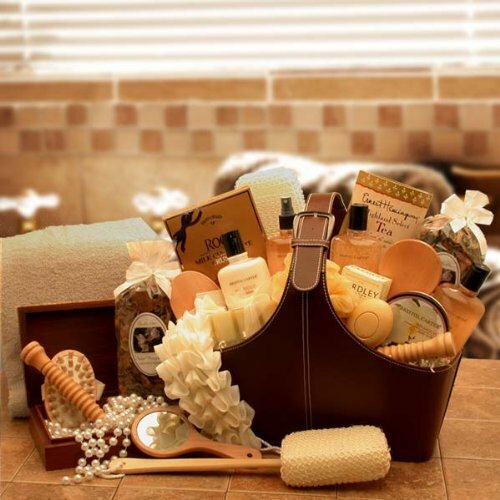 The perfect bath and body spa gift basket! Brighten her day with this vibrant spa gift basket that is packed full with a host of bath productsjust for her!